SSC CPO SI 2017 Exam Question Paper with Answer Keys – Download All 14 Shift SSC CPO (SI & ASI) Exam Question Paper of Sub Inspector Online Exam 2017: Here comes SSC CHSL Tier I Question paper held between 1st July to 7th July 2017. Are you looking for the questions paper asked in SSC CPO 2017 Online exam? Here we have come up with this year SSC Sub Inspector (SI & ASI) questions paper for SI & ASI exam which has been held recently. Candidates preparing for SSC CGL exam must download SSC CPO 2017 Paper-1 questions paper pdf to enhance their preparation. 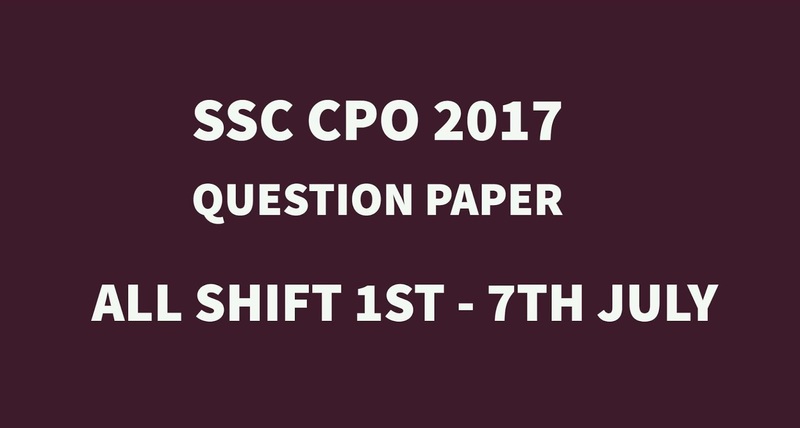 SSC CPO 2017 Exam Question Paper is available for download. To help you in knowing the exact SSC CPO (SI & ASI) exam pattern, we have brought you Previous year SSC Sub Inspector Online Exam All shift online exam Questions question paper with answer in Hindi/ English PDF. The Staff Selection Commission (SSC) had conducted Computer Based online examination for the Sub Inspector & Assistant Sub Inspector in Delhi Police & Central Armed Police force (CISF, CRPF, BSF) Examination 2017. It was overall 14 Shift examination held during 1st to 7th July 2017. Here in this page below, SSC exam aspirants can find all shift SSC CPO 2017 Paper I exam question with answer keys in PDF format. 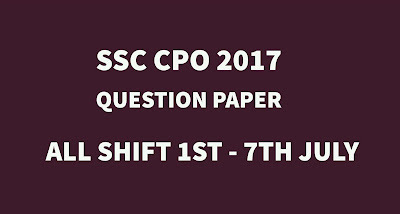 Follow the below given link to download all shift SSC CPO SI Exam 2017 Questions paper along with answer held from 1st to 7th July 2017. We have updated All shift SSC CPO (Sub Inspector) 2017 Question paper along with SSC CPO Answer key PDF. SSC CGL & MTS Aspirant must download it and take advantage of the same. Meanwhile candidates should download SSC CGL Admit Card in order to know their eligibility to appear for SSC CGL 2017. Get in touch with us we will provide more resources too.